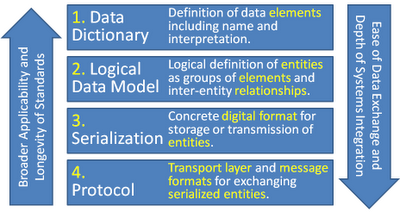 About a year ago I posted a Four-Layer Framework for Data Standards. It was developed as Common Education Data Standards (CEDS) working groups were discussing the space in which CEDS operates and what makes its contribution unique. Today I'm updating the framework document – adding some clarity but mostly reconciling terminology with that used by CEDS. 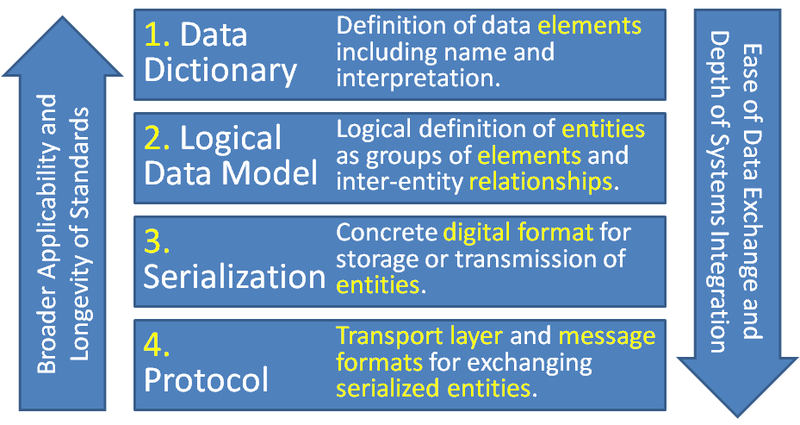 In the June CEDS stakeholders' meeting the group emphasized that CEDS works strictly at layers 1 and 2 (Data Dictionary and Logical Data Model) leaving serialization and protocol to other standards organizations. This leads a unique approach (at least unique to the education standards space) in which the focus is on alignment instead of compliance. To support this strategy, CEDS has posted the Align and Connect tools. The Align tool allows State Education Agencies, software vendors and other organizations to post their data models and show how their elements align to CEDS. Organizations can choose to make their data models public; in which case Align can be used to report the degree of alignment between two data models. The new Connect tool addresses the sharing of metric definitions like graduation rate, student financial aid repayment or college-going rate. Metrics like these are not in the data model, they are derived from that data. And different organizations may combine the data in different ways. Connect supports the sharing and eventual standardization of these metric definitions. Another question I've gotten is how the four-layer framework overlaps with the OSI 7-layer model. Layers 1-3 (Data Dictionary, Logical Data Model and Serialization) in the four layer model map to the Application layer (layer 7) which is at the top of the OSI model. All other layers in OSI are combined into the Protocol layer in the four-layer model. The latest four-layer document is here. It's released into the public domain under a CC0 disclaimer. The greatest gift we can give children is education. Our next generation will require unprecedented levels of knowledge, skills and creativity. For they will not only face the challenges we know today but many more we have yet to identify. Moreover, education is a proven path to prosperity and our most promising solution to poverty. A model for 21st Century education begins by recognizing the innate learning capacity of people. We are born learners and we spend our lives making sense of our experiences. So the first pillar is to preserve that natural learning and sense of wonder; ensuring that students are active participants in the learning process. Next is feedback – consistently informing the student about where they are on the learning journey, how well they are doing and what are the next steps. To this we add purpose that students may understand the value of what they are doing. Education technology isn't required to teach this way. As in other industries, technology simply increases the capacity of teachers and students. But the potential is considerable. More effective students can learn more rapidly and retain their knowledge better. For teachers, automation frees them to spend more time in 1:1 interactions and feedback helps them to know exactly how best to spend that time. The net result is teaching more students better than ever before. I've been blessed in my career to collaborate with like-minded individuals. I've been inspired by their passion and creativity and humbled by the willingness of philanthropists to dedicate so much to this cause. I learn from what they are doing and share as much as possible. I’m confident that our collective efforts will benefit many generations. Moreover, if we take anything with us when we exit this life, it will be the people we've known and the knowledge we've gained. OfThat.com is licensed under a Creative Commons Attribution 3.0 United States License.